Definition/Description: Reciprocal teaching is a strategy that allows the students to become the teachers in a small group. How it works is students are places into groups of four usually, or more and two students share the same "job". Each students is given a job to do while they read the assigned text. The four areas in which students become the teachers in are also proven strategies on their own, summarizing, question generating, clarifying, and predicting. Students take over that job and do so while reading. The summarize will summarize the text at the end, the questioner creates and ask questions before, during, and after the reading, the clarifier, clarifies anything students might be confused about, and the predictor makes predictions throughout the reading. 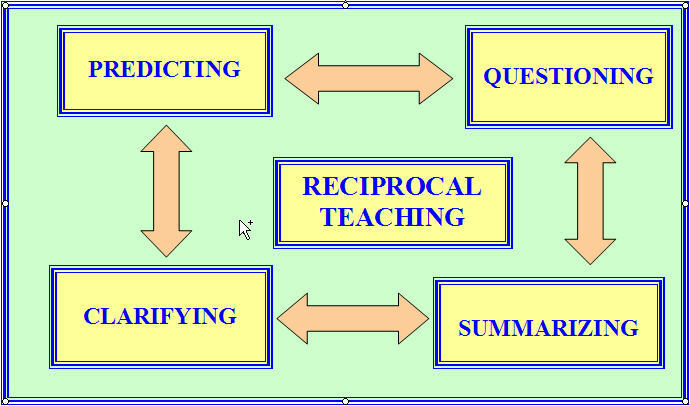 As noted in the picture to the left, these are the four strategies used within the reciprocal teaching strategy and what each does. This means that before using this strategy the teacher must model all four of these strategies separately so they know how to effectively use them within their small groups. This video demonstrates how to effectively teach a lesson using the reciprocal teaching strategy. These four strategies summarizing, question generating, clarifying, and predicting are all researched based strategies that help student comprehend their text (Miller and Veatch, 2011). This strategy is proven to help student with comprehension skills, mainly because it incorporates four different strategies to help reader understand the text. This strategy doesn't only include four strategies, but it has one of the most effective aspect for struggling learning, cooperation. "The national reading panel further identifies cooperative learning as an effective practice in helping student learn reading strategies to improve their comprehension" (Jennings, Caldwell, and Lerner, 2014, pg. 207). Vygotsky and Piaget both believe that students learning through the collaboration with others. They believe that students can learn best through the collaboration, play, and experiences with others (Gunning, 2010). This strategy has been known and researched to dramatically increase students comprehension reading level. "Reciprocal teaching is a highly effective way to teach comprehension strategies" (Miller and Veatch, 2011, pg.48).“To build a foundation for college and career readiness in language, student must gain control over many conventions of standard English grammar, usage, and mechanic as well as learn other ways to use language to convey meaning” (Wright, 2015, pg. 30). Since this strategy incorporates many other strategies it is involving different ways of learning and therefore supported by Wright. The roles switch one person to the right, and then read the next selection. Students repeat the process using their new roles and keep repeating this until the entire selection is done. Teacher guides students' ability to use the four strategies. Purpose: To encourages students to think about what they are reading and their thought process. To allow student to collaborate with other to gain a better understanding of a text. To teach student to be actively involved in monitoring their comprehension, Lastly, to teach students to ask questions during reading. This image shows the rotation within a group for the reciprocal teaching strategy. This video is very detailed about what reciprocal teaching is. This is a good video to watch for first time implementation of the strategy or even to share to students about how it works. allow students to take notes, not in full sentences. Allow student to use references, material, and manipulative, such as graphic organizer, definition, etc. "English Language learners at all levels (and native English speakers" perform better in academic situations when the teacher gives clear instructions for assignments and activities ( Echevarría, Vogt,and Short, 2013). ﻿Below is an example of a worksheet a teacher can use during the strategy. ​Reading: While doing a reciprocal teaching lesson, the teacher should model the strategy at first to show student what they are supposed to be doing. She she choose a topic and assign groups. Have students read a few paragraphs of the assigned text selection. Encourage them to use note-taking strategies such as selective underlining or sticky-notes to help them better prepare for their role in the discussion. At the given stopping point, the Summarizer will highlight the key ideas up to this point in the reading.The Questioner will then pose questions about the selection, ​The Clarifier will address confusing parts and attempt to answer the questions that were just posed. The Predictor can offer predictions about what the author will tell the group next or, if it's a literary selection, the predictor might suggest what the next events in the story will be. Then they will rptate and leep going into reading is done. Mathematics: When teaching a new math concept, the teacher can use this strategy to help student understand the a certain problem and how to solve a certain type of the problem. For example students can look at one question and the predictor can predict how to solve, the answer, or the steps. The questioner can ask question such as what manipulative are we going to use, what strategy will we use to solve, how will we justify, why do you think this is the answer, and other questions like those. The Clarifier will address confusing parts and attempt to answer the questions that were just posed.The summarize will justify the answer and explain the process to get the answer. Science: Teachers can use this strategy to discuss the scientific method, experiments, or most topic. If using this strategy for an experiment the predictor will predict the outcome (make a hypothesis). The questioner can ask question such as what how did we measure that, how much did we add, why did we do that, etc. The Clarifier will address confusing parts and attempt to answer the questions that were asked by the questioner.The summarize will justify the answer and explain the process to get the answer at the end of the experiment. In this example student would have the same job the whole lesson and would switch next time they did an experiment. Social Studies: A teacher can use this process for reading about history topic as well as when discussing different cultures, places, and historical times. For example if students are learning about a new topic, such as the civil war the predictor can predict the outcomes of the war. The questioner can ask question that need to be answered, such as who was in the war, where was it, what was the outcome, etc. The Clarifier will address confusing parts and attempt to answer the questions.He or she might do this by using the internet, textbook, or other references and resources. The summarize will justify and explain the answer and what they found.